have kayaks, will travel: Thar she blows! 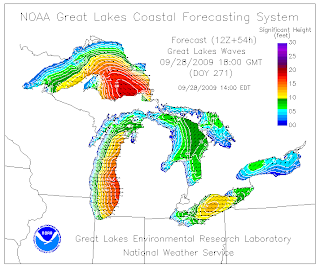 That's right; the forecast for Monday includes 16-foot waves on the Michigan side of the lake--a prospect exciting enough that Chicago paddlers are already arranging carpools. Meanwhile, consider this fair warning that our days of warm surface water are numbered. Your NOAA image says you are going to paddle at 11pm. That would be truly gnarly in those conditions! Seriously, though, when and where are you guys thinking about going in Michigan? I am thinking about cashing in all my "points" for a Monday PM or Tuesday AM survival-paddling session. Tuesday might be cool, if you could catch the waves after the 45knots dies out. I haven't heard from Keith yet, but expect that I will hear something, soon. He would be the ideal person to figure out when/where the best conditions would be in SE lake MI. Hey, John. The plan is still being developed, and we hope to involve Keith in both the timing and the precise location. You're right. We grabbed a very dramatic image, and it is later than we'd intend to paddle. OK, we've replaced that one with an image for the projected waves at 1 p.m. I'm not sure I'd have the skill to participate, but if people go, I'll at least come take pictures. This is Matt. Hailing from Grand Rapids. Stuff we love, part two: Cags!